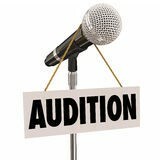 One of the most terrifying events we ever face as singers is our first audition or live performance. Suddenly we have to stand on our own in unfamiliar surroundings and deliver with no help from teachers, friends and family. This practical workshop is designed for anyone preparing to audition or perform. It will focus on presentation and interpretation, stage presence, managing nerves, breathing and simple tips to make any audition an opportunity to shine rather than an occasion to be dreaded. Participants will be accompanied, and will have the chance to perform to a small, informal audience at the end of each class. Individual tuition and coaching support is also available, please contact Art Sawa for details.